THANK YOU GER_SPACE FOR SAVING WINDOWSHINE! Thank you @Teflon_Mike for the logo! 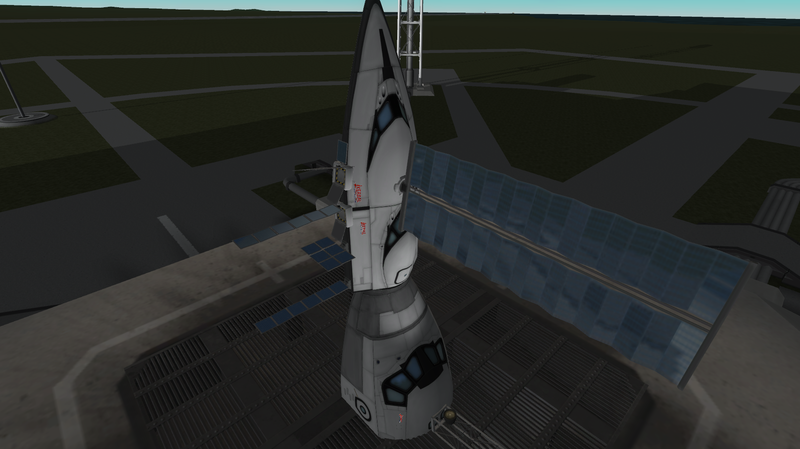 This mod takes advantage of the TextureReplacerReplaced reflective module pared with re-texturing to make all stock windowed pieces reflective; meaning they mirror any object, planet, kerbal, or thing that gets in front of it. Pure Eye candy. WindowShine is dependent on TextureReplacerReplaced managed by @HaArLiNsH (TextureReplacer maintained by @RangeMachine for 1.2x) and ModuleManager maintained by @sarbian. Make sure to install them both first. Mod Support packs (for KSP 1.3+) Thank you @miromed! Shameless plug: If you've enjoyed this mod you might also like the other stuff in my signature! - I hope you enjoy. Do the windows reflect everything? Sky, planets etc..? Yes they do . Anything that is in front of them. 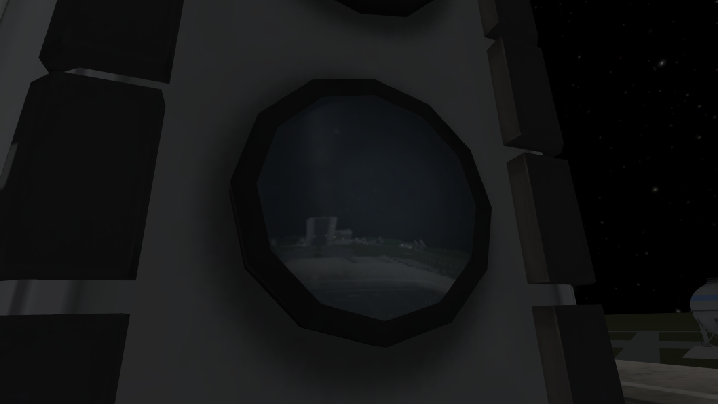 From looking into the small lander can, it looks like it draws a cube on the "inside" of the window and maps the textures/faces of what it "sees" on the sides of the cube. I'm not the creator of this effect obviously... . I'm the texture and config editor. I had to retexture all the capsules, locate the meshes, and add the reflector module into their configs. Well, it's 2:06 AM where I am so... I'll check on this in the morning. Later! Yes they do . Anything that is in front of them. Best part about it, no noticeable lag. From looking into the small lander can, it looks like it draws a cube on the "inside" of the window and maps the textures/faces of what it "sees" on the sides of the cube. I'm not the creator of this effect obviously... XD. I had to retexture all the capsules, locate the meshes, and add the reflector module into their configs. Well, it's 2:06 AM where I am so... I'll check on this in the morning. Later! Yeah I think I saw that effect before, anyway, it's nice to see you actively participating in the modding scene. If nothing else, may i recommend a .bat file or something of the like. Similar to what Ven uses in the stockpart revamp. for easy adding and removal. I'd need someone to make it for me haha. I can edit textures and mess with config files like no one's business, but coding... I'm no good at. Did you edit the images you include, or is your work just in the cfgs? I will make this into a MM patch for you I just need to know if the images have been changed. ...Whoa. I think we're progressing into the weirdly-realistic side of things that is just awesome. Yes the images have been changed. The reflections and image opacity are tied closely together, so I had to make all the textures have opacity of 1% (almost invisible), and leave the windows at full visibility. I'm planning on making a tutorial so other modders can add reflections to their parts. It's fairly simple with practice. EDIT: How easy would it be to add additional reflective parts to your patch? Could you make a config file that lets you add additional parts? I'm planning on making solar panels reflective too and I'd hate for you (or someone) to have to update the patch every time I make more reflective parts. It could also be useful for other modders. Looking amazing, I check it out too, though the replacing of stock files as bit no-no, will too check on if we can make a MM patches, and I guess TR can replace the texture just by having the complete file path inside TR itself. - Note that I'm using old EVE with my custom cloud pack. I've had errors with Scatterer before so I haven't been using it in my main save. I've still got it tho . This looks awesome! I can't wait to try it out when I get my new laptop. Any progress on a tutorial for modders? I would like to incorporate this into my solar panels for the various mods I'm in the process of doing. 1. If your part has a flag on it download the most recent version of DebugStuff. This mod can show the internal meshnames of parts, which you will need to find to prevent the flags transparency from turning black. More on this below. Replace ~~~part name~~~ on the first line with the internal part name of the part you are adding reflections to. 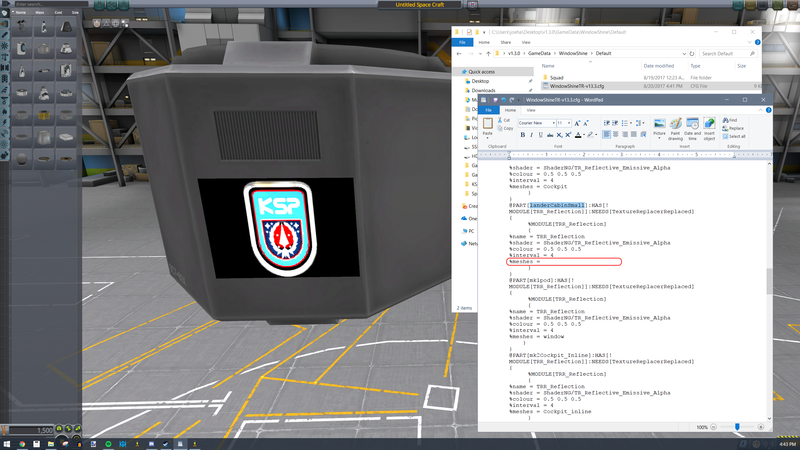 Example - the Mk1 Lander Cabin is referred to as "landerCabinSmall" by the game, as seen on the third line after "name = ". After adding and editing your ModuleManager part Module, save it as a .cfg file with whatever name you want the users to see. Personally I'd suggest following the naming convention used in the other mod packs. 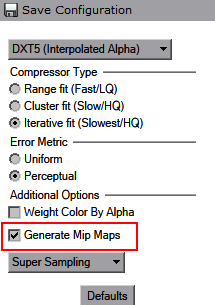 Copy/save this .cfg file to the TextureReplacer main folder (Location inside of GameData shouldn't actually matter but it's most sensible in TextureReplacer). 3. 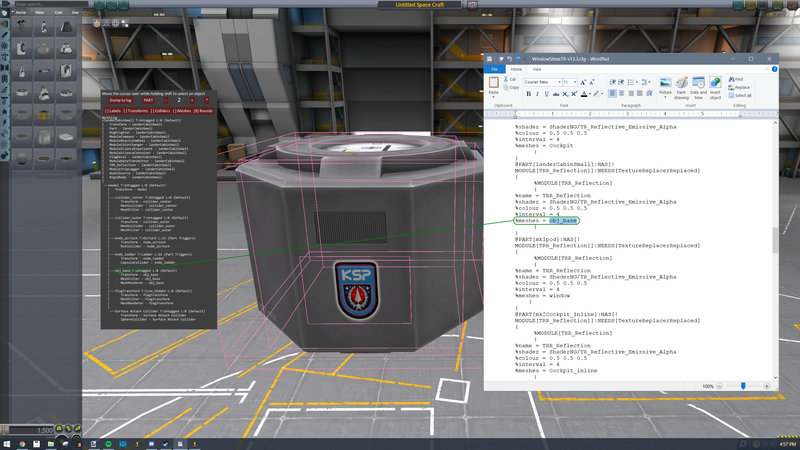 Boot up KSP and load the parts you added a config to. If your .cfg file is correct then most of the part should be reflective. If your part has a flag on it you will also notice that any transparency in the texture will show up as black. We'll fix both of these issues in a second. If you did this correctly, then the areas you want to be reflective should be reflective, and the flag transparency should now look correct. Everything from here is just touching up part textures! 5. Edit your part texture so only the parts of the texture you want to be reflective are showing. Everything else should have an opacity of 1%. Dig through the original mods folders until you find the texture pertaining to the part you're adding reflections to, and then open it in an editing software. I use paint.net with a alpha removal plugin, but any editor that can create layers and remove transparency should work. 6. Take the texture you've edited/created and recreate it's file path from the GameData folder. After you've done this place the texture in it's part folder, and place the stack of folders inside TextureReplacer/Default/ so that it should look like "TextureReplacer/Default/[original mod folder]/[part category folder? ]/[part folder]/[your texture]" - use any one of the other mod downloads as an example if you're having trouble with this. You should probably mention the OP under Known Issues that it's not compatible with OpenGL mode (as TR's reflection isn't). Doing so know. Thanks . EDIT: New release. Added Mk3 crew cabin (for some reason the files are located in fuel tanks), and made missed windows on the Mk2 pods reflective. I'm not having any luck with this mod. No reflections at all. 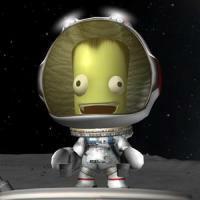 Could it be a compatibility issue with 64-bit KSP? Edit: A clean install did the trick. Excellent mod. Nice work Avera9eJoe! But modulemanager involves literally no coding, using MM is super easy, and always a safe bet. Outstanding! What a great addition! So how are the reflections rendered exactly? Is this a feature of texture replacer? How does the shader work? texture replacer has the function but its default settings are not good but i fu tweak u can get just like that gif.